Kong Classic Dog Interactive Treat Toy has an unpredictable bounce for games of fetch and is the ideal rubber compound for dogs that love to chew. It’s not just a toy, IT’S A KONG. Stuff the KONG with treats or wet food to keep your dog busy! The KONG provides a fantastic challenge for your dog, helping ease stress in dogs that suffer from separation anxiety. The food you place in the KONG is not limited to one particular thing. You can smear vegemite, peanut butter, wet food, dog treats and more into the KONG. For a further challenge, stuff it with wet food/paste and put it in the freezer! Want to keep your dog occupied for hours? Place multiple stuffed KONGs around the house or yard and keep your dog sniffing, searching and licking! 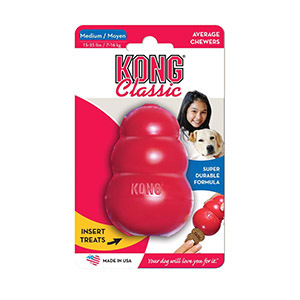 Kong Classic Dog Interactive Treat Toy is the gold standard of dog toys and has become the staple for dogs around the world for over forty years. Offering enrichment by helping satisfy dogs’ instinctual needs, the KONG Classic’s unique all-natural red rubber formula is ultra-durable with an erratic bounce that is ideal for dogs that like to chew while also fulfilling a dog’s need to play. Want to extend play time? Be sure to stuff with tempting bits of kibble and entice with a dash of peanut butter. Add to the fun by adding KONG Snacks and topping with KONG Easy Treat. – Unpredictable bounce during play! – Stuff it with dog treats or wet food! – Freeze with your dog’s favorite tastes for extended play – perfect for hot summer days!! – Great for most adult dogs! The KONG Classic is suitable for most adult dogs, if you have a very large or tough dog, or puppy, you may want to consider other products in the KONG range.